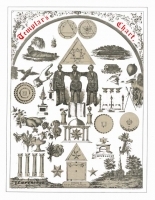 A print of the teachings of Freemasonry titled "Symbols of Freemasonry" that contains the symbols of the Craft! This print is 11" high x 17" wide and is printed on parchment. It has dozens of symbols which are all well integrated into the art. It is how Freemasonry was taught when most people could not read or write.